"Salted or seeded, these make a great snack." Stir sugar into 1/4 cup warm water in a small bowl. Sprinkle yeast over top. Let stand for 10 minutes. Stir to dissolve yeast. Combine 1 1/2 cups warm water, flour, and salt in large bowl. Stir yeast into mixture. Add a bit more flour, if needed, so dough isn't too sticky. Knead for 8 to 10 minutes until dough is smooth and elastic. Place in greased bowl, turning once to grease top. Cover with tea towel. Let stand in oven with light on and door closed about 45 minutes, or until doubled in bulk. Punch dough down. Roll into log. Mark off into 12 portions, and cut. Roll each portion into 1/2 inch rope. 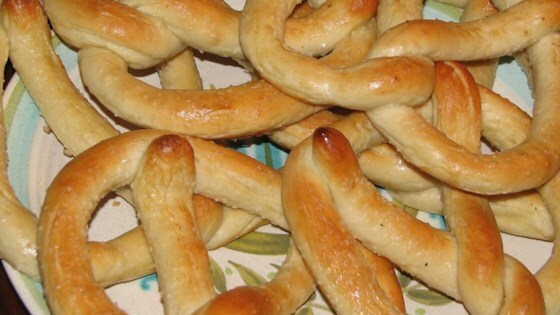 Shape each rope into pretzel form on greased baking sheets. Beat egg white and 1 teaspoon water with fork in small bowl; brush glaze on pretzels. Sprinkle some pretzels with kosher salt, and some with sesame seeds. Bake at 450 degrees (230 degrees C) for about 15 minutes. Turn out onto racks to cool. This recipe is delicious! I brushed them with olive oil instead of the egg, It made them more shiny, and the salt on top stuck better. My family LOVES these! Bakes up soft. My 12 year old son made these and they were great. We used sea salt for the outside of the pretzels before baking. It was good for me to do since it was my first time using yeast! Instead of putting kosher salt on it, I coated mines with cinnamon-sugar. My family loved them. I didn't really like this. I think the recipe definately needs improvement. These turned out hard and tasteless. I suppose from all the good reviews it may have been human error, but I followed the recipe and am usually a decent baker so it was disappointing.